The Southern Highland Craft Guild (SHCG) was established in 1930 and has worked steadily since then to document, encourage, support, and exhibit the handicrafts of the people of North Carolina and the Southeast. Olive Dame Campbell was instrumental in the beginnings of the organization. After her husband's death in 1919, Campbell embarked upon a study of the folk schools of Denmark and surrounding countries. This trip inspired the founding of the John C. Campbell Folk School and, after visiting a cooperative crafts shop in Finland, the first steps toward organizing the SHCG. Other leaders interested in handicrafts revival efforts recognized the need for an organized cooperative effort to preserve, support, and market handicraft skills and products. In December 1928, a group gathered in Penland to discuss the state and place of handicrafts in the region, how an organized cooperative might work, and what it could accomplish. These representatives agreed to work toward establishing the Southern Mountain Handicraft Guild. The group mounted a comprehensive exhibition of the region's handicrafts for the first time at the spring 1930 meeting of the Conference of Southern Mountain Workers. At this gathering, members passed the constitution and by-laws for the guild. For the first time, regional schools, producing centers, and artisans were aware of what each institution produced and understood the possibilities for transforming the handicraft tradition into a visible and meaningful part of the region's economy. Guild members organized a research library, started a membership directory, and planned new exhibitions. In 1931 Frances Goodrich conveyed the ownership of Allanstand Cottage Industries and its salesroom to the guild, providing a space to showcase and market members' handicrafts. At its spring 1935 meeting, the guild dropped "mountain" from its name and substituted "highland" to reflect the broad goals of the organization and the refined image its members wanted to convey about their handiwork. In July 1948 the Southern Highland Handicraft Guild (SHHG) and Southern Highlanders, Inc. sponsored its first craftsman fair in Gatlinburg, Tenn. The fair connected visitors with the best crafts and their makers and clearly showed the importance of handicrafts in the life of southern Appalachia. The SHHG and Southern Highlanders, Inc., merged in 1951, and the annual fair moved to Asheville, where the guild was now located. In the 1960s the guild sponsored two fairs each year in Gatlinburg and Asheville and initiated a new era of management and growth. The National Endowment for the Arts, the Appalachian Regional Commission, national museums and galleries, and individual consumers had fully accepted the uniqueness, beauty, and value of southern handicrafts. In the late 1970s, the Appalachian Regional Commission allocated funds to build a Southern Highlands Folk Art Center on the Blue Ridge Parkway outside of Asheville. The center, opened in 1980, provided a home for the Southern Highland Craft Guild, preserving the region's handicraft heritage and encouraging new ways of expressing beauty. 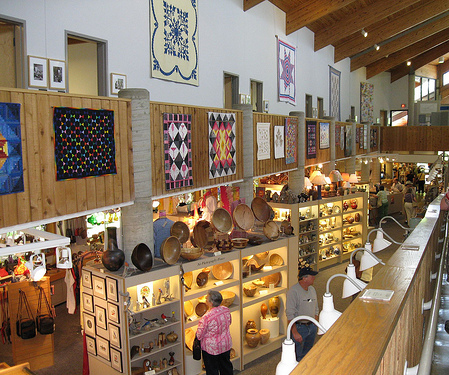 The Folk Art Center also provided a popular marketplace for the exhibition and sale of southern Appalachian handicrafts. By the early 2000s, the Southern Highland Craft Guild had more than 700 members in nine states, producing crafts that reflect both the important traditions of the southern Appalachian region and the contemporary forms arising from the growth and diversity of the southern crafts movement. The Folk Art Center welcomes 300,000 visitors each year who come to view the finest in traditional and contemporary craft of the Southern Appalachians or take part in the many educational events that are held throughout the year. Garry Barker, The Handicraft Revival in Southern Appalachia, 1930-1990 (1991). Allen H. Eaton, Handicrafts of the Southern Highlands (rev. ed., 1973). Inside the Folk Art Center. Image courtesy of Flickr user Lal Beral. Available from http://www.flickr.com/photos/andree-debashish/3631207480/ (accessed June 15, 2012). 1 January 2006 | Cross, Dennis W.
I grew up in Norris, TN, near Norris Dam, in the 1940s-1950s, and we had a Southern Highlands shop there. I would say that sometime in the 1950s it closed. Even at my young age (not yet a teenager), it was like a good friend died, I loved to visit the shop so much. Even though I have not lived in the south for many years, I still look for pieces of art that craftspeople that I knew produced. It is hard to find out west in Utah.